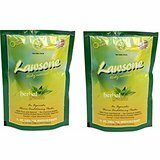 We are instrumental in offering highly effective Lawsone Herbal Henna Powder (100gms). Known for its excellent quality, rich color, sweet aroma and long shelf life, our Lawsone Herbal Henna Powder is an ideal solution for complete hair care. It is hygienically processed using the best quality henna leaves and natural herbs. Then, we pack our Lawsone Herbal Henna Powder in premium packaging material to keep its properties intact for long. Our Lawsone Herbal Henna Powder contains no chemicals and causes no reaction or allergy on skin. Usage : Mix Lawsone Henna powder with water, make a paste like honey. Keep the paste for 45-60 minutes or more and apply the paste gently on hair on fraction of hair from roots to the desired length. For dark and rich color cover head after applying henna with a plastic cap. Keep it for 45-90 minutes and rinse the henna from hair with normal water. Do not use shampoo. Dry your hair .The color will improve naturally in 1-2 days. Natural way of coloring hair. Helps to make hair soft, shiny and silky. Seals the oil in the hair and condition the hair. Protects the hair against sun damage.